PUBG Hack, this might sound quite fascinating for some people, but what actually its possible works, find out more in the article below! PUBG Mobile is the most popular game these days, and it is in the #1 position of most trending App in the Google Play Store. The game is too much addictive, once in, never out! For me, it is the best multiplayer game I had ever played in an Android phone. The concept of this game is too good to get that Chicken Dinner. One squad have to survive till the last zone. The weapons used in this game are adopted from real life army weapons. The multiplayer concept in the Unknown Battleground made this game more popular because one can make a squad with their Facebook friends. But when it comes about hacking PUBG Mobile, is it possible? Let us find out! Many people think that, if a game is running under a secured server, it is not possible to hack. PUBG is operating by Tencent, probably the biggest name in the gaming world. No doubt, PUBG is backed and run under a protected server. But it is not true that hacker can not hack any such games. Like other software hacks, a game can also be hacked. You can see as an example of Mini Militia. It was quite famous back in 2016. There were a lot of hackers inside Mini Militia, and you can’t kill them to win. So, how the games are getting hacked? When you download a game from the Play Store, there will be some files that are placed in the Android Obb folder. Since Android is an open source software, it is quite easy for hackers to modify any Android data. So, what hacker do is, they copy the files and modify it using their secret tools. They can alter in such a way that you can unlock all the weapons under the game, or achievement, or even extend the level. So it is definitely possible to hack any particular game by making some changes in the script. Now the main question for this post is to get answered. Is there any cheat code for PUBG Mobile? On which OS PUBG Mobile can be hacked? How PUBG Hack is done? Is it legal to Hack PUBG? It is possible to some extent. But the type of hacking PUBG is various. There are different approaches to hack Android games, like using modded APKs. But the most popular way in server-based game is the use of root access. If your device is rooted, you can modify the system files, and unlock all the features of Android that are not possible with a non-rooted device. Task ranging from WiFi hacking to Overclocking CPU frequency can be done on a rooted device. So what hacker do with the rooted device is, they take the system access advantage, and cheat the game App. There are several PUBG Mobile APK Mod available for both rooted and non-rooted devices on the internet. But these are completely illegal to use. You might get permanently banned from the game by using PUBG Hack. Tencent is strict on Mod APK for PUBG. If you violate their rule, you will lose your account along with your existing achievements. If you want to play the game even after getting banned, you will require to make a new account. In that case, you need to start from level 1, and no one wants to get noob again in the same game, right? Some modded APK may also contain malware files, that can harm your device. They can even steal your personal data, and you may face a problem with that. Absolutely BIG NO! Tencent doesn’t want that! Unlike GTA San Andreas and Vice City, there are no cheat codes for PUBG Mobile. But you can find some shortcuts, that may help you for easy gameplay. It can be hacked on both Android and iOS. The law is the same for both the Operating System. Root for Android and jailbreak for iOS. But Android is quite easy to hack, as it is open source. Also, an official emulator (Tencent Gaming Buddy) is available for PC, that can run PUBG Mobile on a computer. But Apple has some strict policies and security. So, its quite tight for the hackers to hack PUBG in iOS. The process is similar to other hacks. Hacker manipulates the file by editing the scripts. If the phone is rooted, they can edit the system files, which helps them to modify the code and unlock several features. This way, the hackers are dominating some games. Strictly NO! We already mentioned it above. You will get permanently banned from your PUBG account. Tencent does not allow anyone to use modded Apps. So, please respect their law, and enjoy the gameplay legally. In some countries, there are strict laws against hacking. So better to stay away from hacking stuff on your phone. However, there are some mods available for offline play. You may try out those for fun purpose. In that case, please make sure that you are not log in, or your mobile data is on. But personally, I do not recommend you to use any kind of modded games on your phone. It is an offense! Please respect the hard work of the developers. They created this game for you that too for free. You are not paying, but at least you can give some respect to them. Hacking is illegal everywhere. There are some strict laws against piracy. Therefore we suggest you not to involve in such activities. Rest, we leave it on you! It’s your wisdom, as Droidfeats do not promote any kind of hacking techniques. 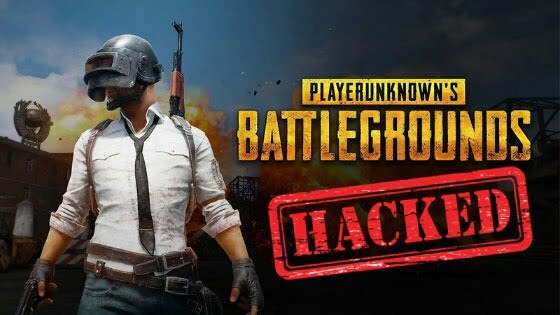 At last, please do share this article with your PUBG mates, so that they should be aware of hacking. Next articleDownload Magisk 17.2 root package (ZIP + APK) here!